Over the last couple of weeks, we have had, for lack of a catchier phrase, a run of seriously bad luck. First, we had a very serious accident with one of our two vans. Thank God, no one was seriously injured and none of our kids were in the van at the time. But the van looks pretty bad. It’s been towed away to Tegucigalpa where I’m sure it’s waiting for some insurance inspection. In any case it is presently unavailable to us. About the very same time, we had the other van in the shop to have the tires replaced. They were replaced quickly, but ironically enough, that van developed bad brakes that needed replacement. Whether one had anything to do with the other, I will leave to your discernment. The brakes got fixed and our second van is working quite well now, but we were without any van for about two days. We have one more vehicle, a very large Ford pickup with a substantial bed. When we don’t have any choice, and we are only driving the kids a short distance around town, they can climb into the bed of the truck. It also has amble cabin space so the youngest of the kids can sit inside. But the bad luck continues. The truck overheated and is presently out of commission. No one has really looked at it yet. It’s Holy Week, now so no one is really working. We’re down to one vehicle, praying that it holds up. 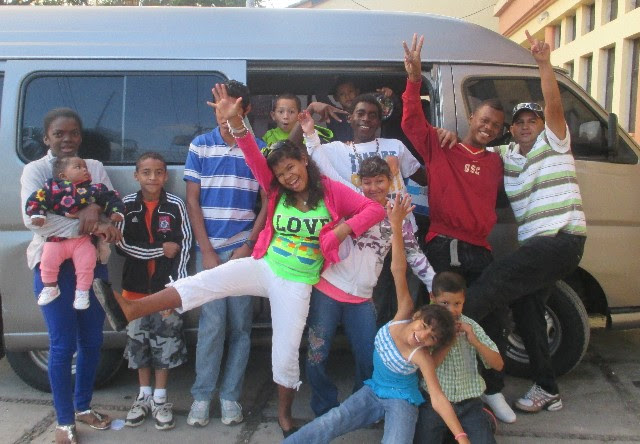 We delivered eight kids to their families for Holy Week vacation. Laura and I were knocking on every piece of wood that we could find, and thinking about saying novenas to obscure patron saints of automobiles. But we had no issues delivering the children. Still, when we have had to, or wanted to, take all the kids out of the facility for an outing (three times since the vehicles have gone out of commission), we have been forced to make double trips. We’ve muddled through. The mechanical problems, and we have had even more, would be bad enough, but Mother Nature has not been kind either. We are now definitively in the dry season. There is dust everywhere. Everything is brown. It is extremely hot. Knowing that Massachusetts just had another snow storm, this last point may not invoke a great deal of pity. Still, every day starts out with a haze covering the sky and it sort of feels like maybe it will rain. But it never does. The haze simply lifts and an oppressive sun takes its place. Few people leave their homes between 10 AM and 3 PM because they will wilt away. The rivers are all dried up, and I suspect the wells are low as well. Both the town and we have had some water issues. The town had been turning on the water twice a week for the residents. They are now turning it on only once a week for a two hour period. They claim this is because a lot of people have not paid their bills. I suspect this is true. But I also suspect, though this has not been said, that the water rationing is meant to conserve what little might remain in the well. Laura and I are fortunate in as much as we have a tank on our roof and a pump to fill it. Since the water was turned back on in the town in December we have not been without running water, an appreciated luxury. But this Wednesday our shower didn’t work. We couldn’t figure it out at first. But after we thought about it, we realized that the town had probably turned the water on last week during a period when we didn’t have electricity. A simple equation: no electricity, no pump, no filled tank, no running water. But the water was turned on for two hours on Wednesday, we had electricity, and our tank was refilled. We were fortunate again to only be inconvenienced for a day. Our electricity usually goes out about twice a week. This is usually just for a couple of hours. But lately, it is going off on an almost daily basis and for eight to ten hour spans. I can only imagine that this has something to do with the drought like conditions, and the scarcity and cost of hydroelectric energy. But then there’s also been the wind. We had a violent wind storm with forty mile an hour gusts that lasted about a day and a half. I was quite surprised that there had been little damage. A few roofs were damaged and the wind turbine at Montaña de Luz was downed. Again no serious damage, and it can be put back up. Though again I can’t be certain if it was related to the wind, but the electricity that feeds Montaña de Luz’s water pump failed the day after the storm. They didn’t have running water for a day and a half until it was repaired. Mostly the wind was scary, as was the earthquake. I take it you know that Nicaragua had an earthquake. We aren’t very far from Nicaragua. For us, it was just a little rattling that lasted about fifteen seconds. Other than those things, and the fact that our house feels like an ocean bungalow with all the sand on the floor, we’ve been doing quite fine. Holy Week here is as much about vacationing as it is about faith because everyone has it off. Today, Holy Thursday, we took our kids to a swimming park on a farm about forty-five minutes from here. Of course, we had to shuttle them there in two groups as we still are limited to the one vehicle. But it was a gorgeous day. Apart from the swimming, there’s a small zoo, a rodeo, and horseback riding. We had a marvelous time. It is just so enriching to see the smiles on our kids’ faces. I drove the two shifts back as our director had taken the two morning shifts. 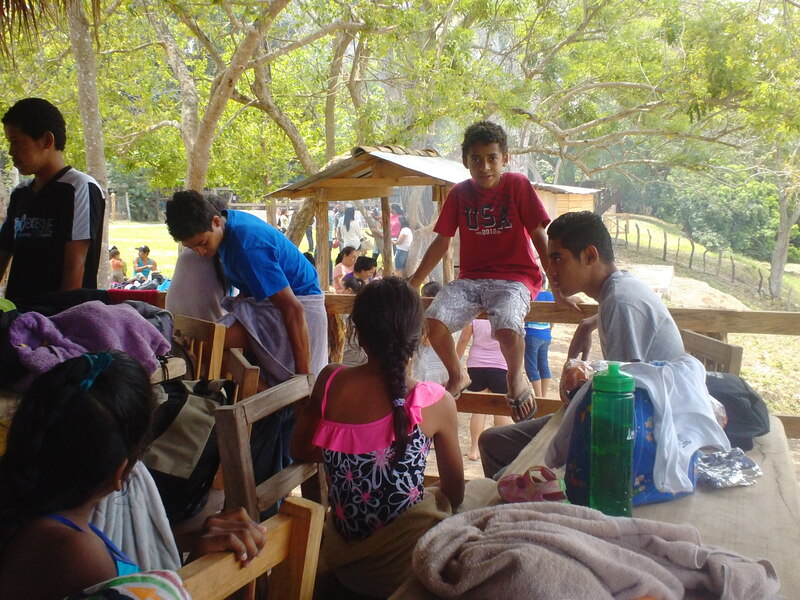 A Nueva Esperanza resident and a good friend of Montaña de Luz was at the park as well with her family. As we drove out on the second trip home, she and her family were in her pickup truck a few vehicles ahead of us. As we turned onto the main way, we noticed they had stopped. They had a flat tire, no spare. Nothing is open, so there is no place to repair it until Monday. Leaving the car abandoned would most certainly mean it would be gone, or at least totally stripped, by morning. We stopped. We offered them our spare. They thought they might have enough air in the tire to make the trip home and attempted it. We drove behind them. About half way there, they couldn’t risk driving it any further and stopped. We stopped behind them again. This time we gave them our spare and helped them change the tire. It was slightly bigger than their other tires, but it could be driven the short distance they needed to go. With all the problems we’ve had over the last two weeks, it made me think of the adage, “I used to complain about having no shoes until I met a man with no feet.” In this case, tires. It’s Holy Thursday and we’re fortunate enough to do some feet washing.